If you’re reading this review, chances are you’ve already made up your mind about whether you’re going to plunk down some cash for one of the four versions of this “Anniversary Edition” of Sgt. Pepper’s Lonely Hearts Club Band. Heck, you probably decided that when this deluxe reissue was first announced. What you’re really looking for is justification for your purchase. Or maybe a little further evidence to support your desire to upgrade from the single disc release to the big six CD boxed set complete with the holographic cover and reproduction LP inserts. The simple truth is that you’re going to be satisfied no matter your level of Beatlemania. Each edition of the Sgt. Pepper’s reissue features the new Stereo Mix that was lovingly crafted by Giles Martin, the son of the Fab Four’s producer George Martin. And it is a marvel. With only four tracks at their disposal at any time, the band had to fill up one tape, bounce those tracks to another tape and then use the three spare tracks for overdubs. Martin had access to every last spool of tape from these sessions and used them to create the clearest and richest version of this album ever released. Every spin will reveal new details and depths that weren’t present even on the remaster that was released in 2012. The little quaver in Ringo’s voice as he tries to hit all the notes on “With A Little Help From My Friends.” Every last pluck of the harp that opens up the still heartbreaking “She’s Leaving Home.” The haunting emotion that George Harrison brings to the vocals on his spotlight song “Within You Without You.” That little added rumble to every bass line. The shaker that carries the first minute of “A Day In The Life” sounds like it’s being played by someone standing right next to your stereo. You’ve heard these songs hundreds of times but they have never sounded this present. What might entice you to spring for at least the double-CD set is the second disc featuring alternate takes of these seminal tunes. 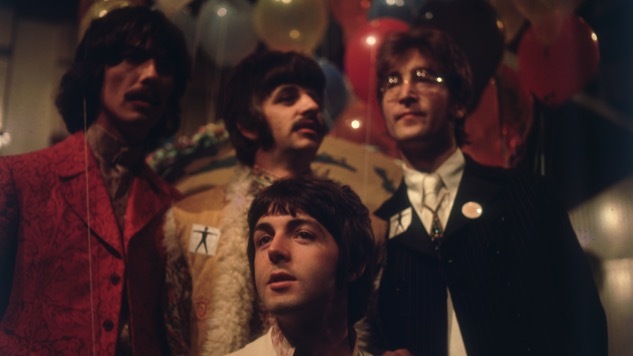 They provide a nice little peek behind the curtain as some include little snippets of studio banter and more stripped down versions of the songs as the Beatles tried to figure them out in real time. That’s where you’ll get to hear the raw recording of the Indian ensemble that George brought together for “Within You” and how the band’s first idea for the closing chord of “A Day In The Life” was to do it with vocals. Even more fascinating is the various stages that contemporaneous single “Strawberry Fields Forever” went through before everyone found the perfect tempo and mood. It’s almost startling to hear it move from an austere ballad to an almost novelty-like romp to the version that was released on a 7” single in 1967. There’s even more of this available on the lavish six-disc set. There are a few more additional steps present to hear how the group got “Strawberry Fields” to its finished state. The same is true of almost all the songs from the album and “Penny Lane,” the b-side from the accompanying 45. Each raw take intensifies the appreciation for how every element of these songs had to come together to make them work as well as they continue to do. The string section and harp track recorded for “She’s Leaving Home” is lovely enough but is nowhere near as heart-rending as when Paul and John are singing with them. Conversely, what got mostly dampened in the finished version of the album was the pop of Ringo’s drums. Free of overdubs, his minimalist power on tracks like the “Sgt. Pepper’s” reprise and “Good Morning Good Morning” comes to the fore. No matter the track or the version, though, the alchemical reactions that took place for the 10 years that the Beatles were together spark and boil anew. Plus, you get a beautifully designed hardcover book that places the album into the proper historical context and exhaustive details about the recording sessions and the creation of the iconic cover art. But, again, you surely don’t need me to tell you all this as you keep an eye on the door for that package from Amazon or for the doors of your local record shop to open. Once you get your hands on it, enjoy every last second of it. Whether you’re a new convert or a longtime fan, you’d be crazy not to.